Offer your child every chance of success in his/her studies by renting a studio in Tours. Our Study’O residence in Tours is located opposite the Campus of Grand-Mont, Faculties of Sciences, close to shops and public transports, so it will be easy to move around in town. No loss of time, with Study’O in Tours, your child can move directly into his/her studio in Tours. All of our homes are furnished and decorated with care and equipped with a kitchenette, a sofa bed (140 x 190cm), a desk area, a bathroom and toilet, and a broadband Internet connection. Study’O Tours is a residence with accommodation services, offering 127 apartments from a 19 m² studio to a 35.5 m² one bedroom apartment. 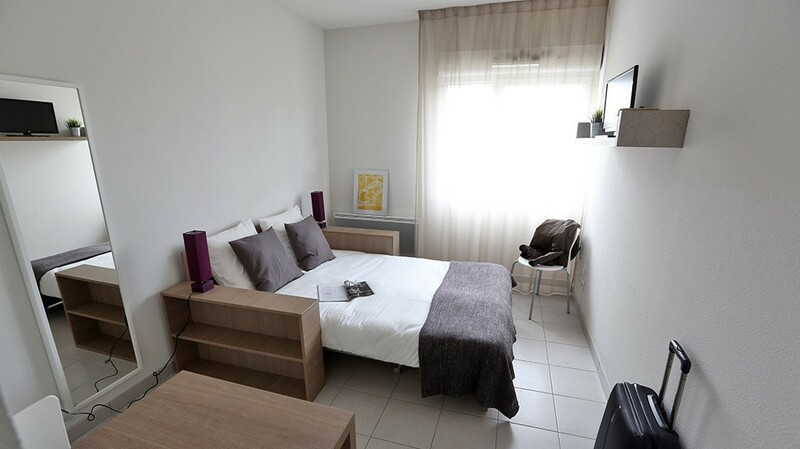 A wide range of services and conveniences are offered so that every day’s life will not be spoiled with daily tasks: linen rental, laundry self-service, household, car parks… Everything has been thought to facilitate his/her stay in a studio in Tours. Don’t wait any longer and book now through our on-line booking form.